Yesterday I was lazy and didn't upload any pictures to accompany my bleg for help. 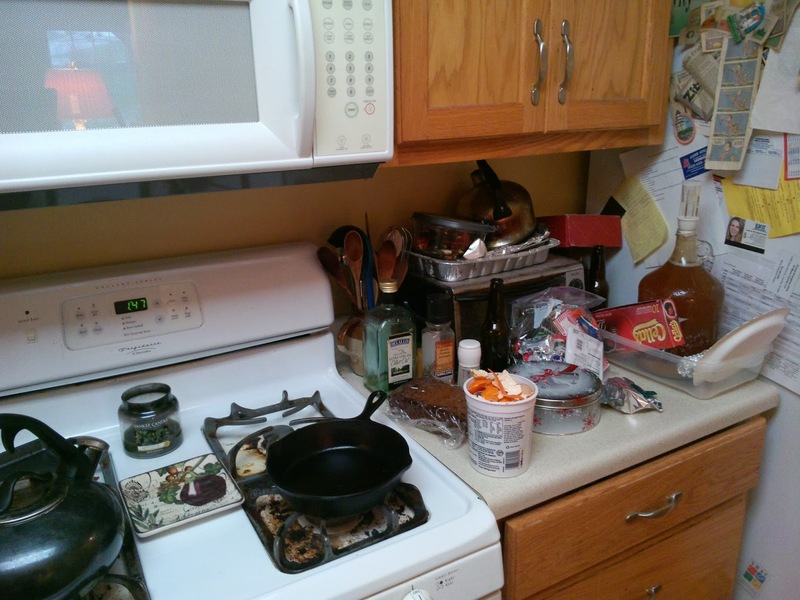 By popular demand, some pictures of my sad, dysfunctional kitchen. 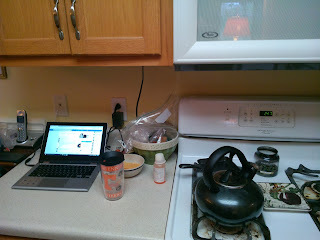 Lemme tell you, getting pictures off a tablet and uploaded into Blogger is a pain in the rear. NB: I didn't pick up before taking these pictures. Yes, I know I have too much stuff out. Yes, we need to purge. I'm trying to figure out how to get there from here. First a little spin around the kitchen while standing in the middle of it. I stood in one spot and just took pictures in a clockwise circle. Here are two pictures from either end. 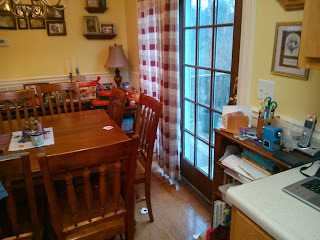 One is taken standing right in front of the garage door and the other is my regular view from the supper table. Here's where it starts getting real. 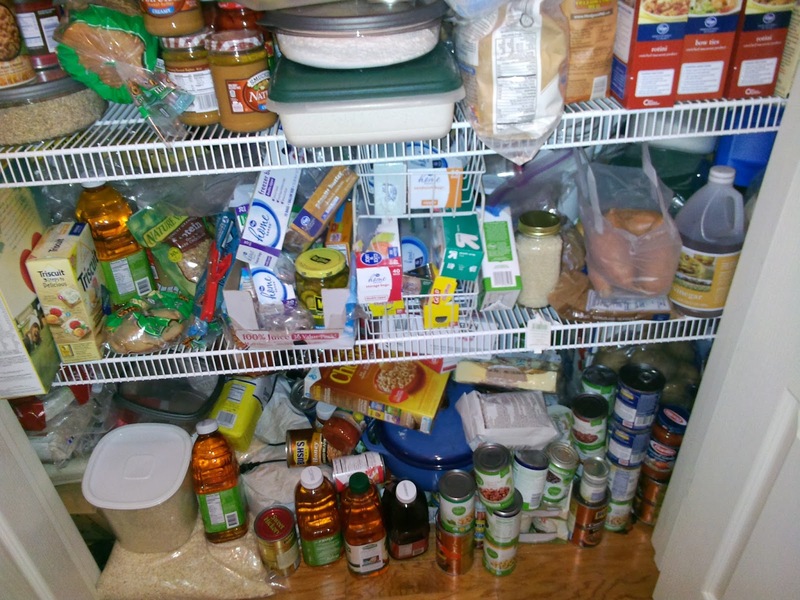 This is what the inside of our pantry looks like. For real. Kroger had a fantastic sale on Delallo products, as you can see. The top of the fridge is just piled. Something could be done up there, but what? The inside of the only cabinet that isn't just dishes and glasses. Honestly, we have too many cups and mugs and plates, but I don't know how many to keep. What if you need it, ya know? 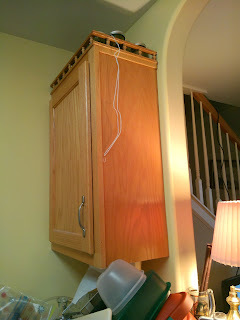 This cabinet is where I want to mount a solid magazine rack for storing devices. However the rack would need to be eleven inches wide at maximum (unavailable at Target). The bookshelf under this spot sits on top of a vent so we have to be careful what we place here. Also that wallspace there is less than two feet wide. 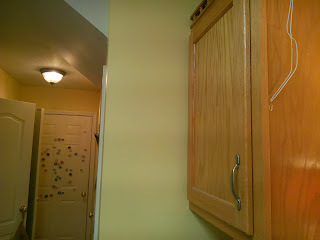 This is the only spot I can figure to add a magnet for knives, and it is only fourteen inches wide. This is over the drying rack. This is another possibility for mounting something, but there is a lot going on in this spot. 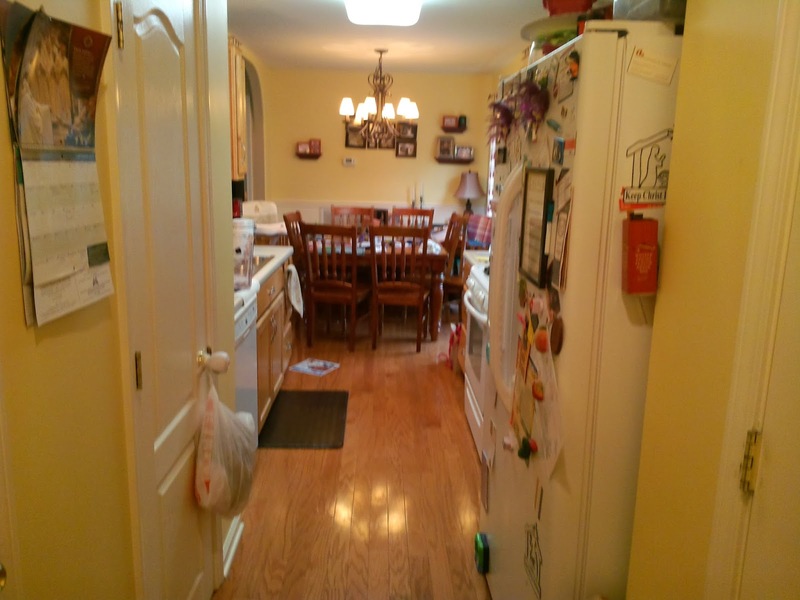 It is the main place for unloading the fridge and pouring drinks and where the toaster is. So I don't know. 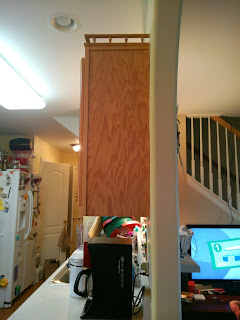 Here is where I want to put a hook for Dave's cast iron egg pan. It get used every single day so doesn't really need put away, but it would be good to have a place to stick it that isn't on the stove or the countertops because it gets in the way when trying to cook other things. 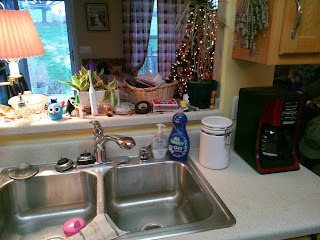 Here is the other cabinet on the other side of the sink. It's full of mugs. I'm not sure what can be done with it. 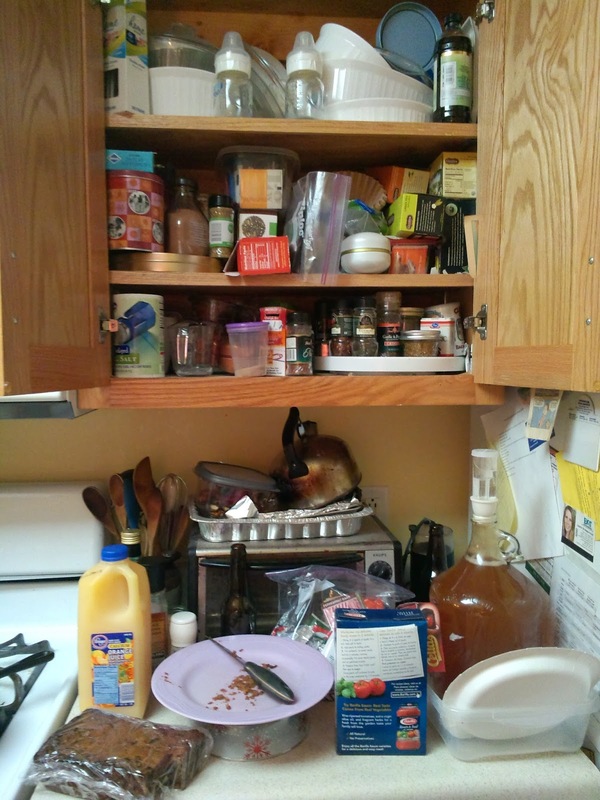 The other side of the mug cabinet is the busiest spot in the house so I don't want to add anything that might further frustrate traffic there. Another spot that could be arranged differently if I can find another spot in the house to put this table. 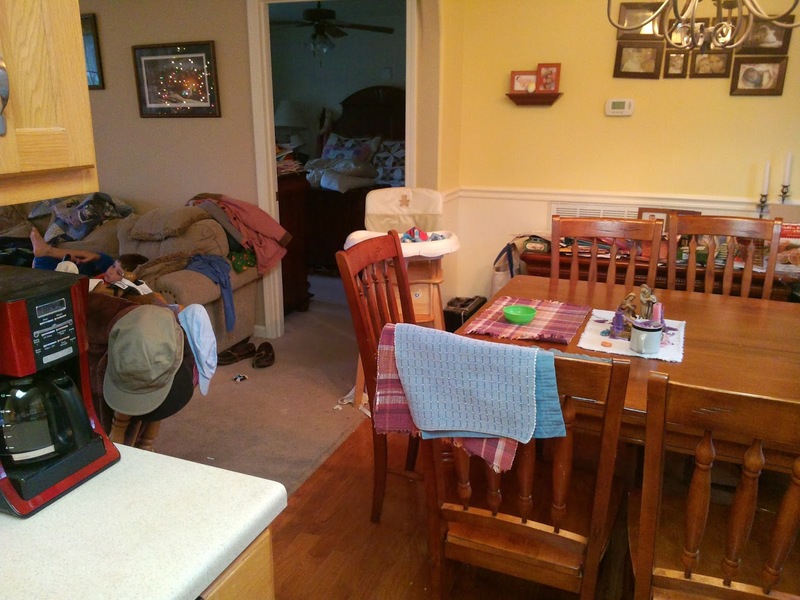 Finding another spot for the table is questionable without getting rid of furniture, but I don't want to discount the possibility. 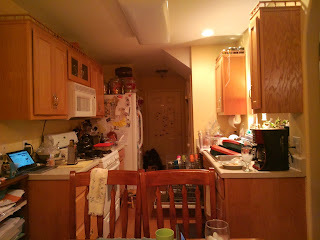 This is the back corner in the kitchen behind the table. 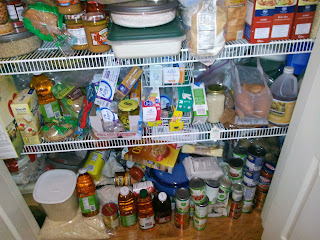 It is not very accessible and tends to get piled, as you can see. So there it is. That's our kitchen. What do you think? Throw out your ideas. Just want to add that you can download a free Blogger app. 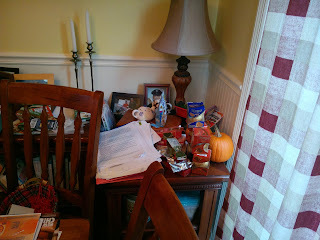 My daughter uses this for her social studies blog. She drops the photos into a new post and then uses the laptop later to write the text. This is so much fun. I want to come help you! 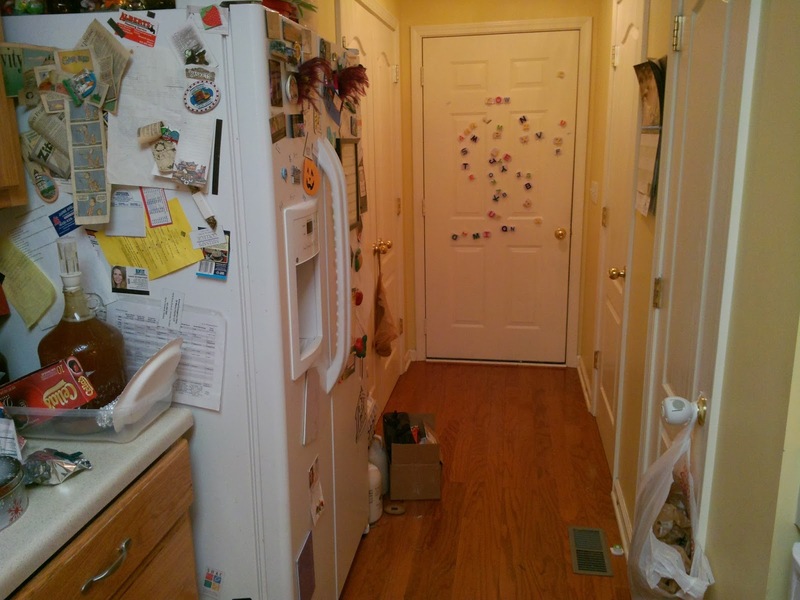 Your pantry is great! Not too deep and nice and wide. 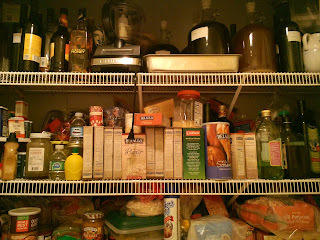 I would start with designating sections: baking, cans, noodles, etc. We go through a lot of bread (we used to make our own but having gotten out of it) so I freeze everything but one loaf at a time. As for dishes pick the cabinet you want to keep them in, make sure you have at least a set of 10 (plus if you have plastic for the kids) and keep what you love. 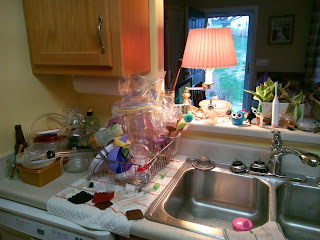 I will post a pic of my dishes cab. I cant figure how to post a pic in a comment from a mobile. 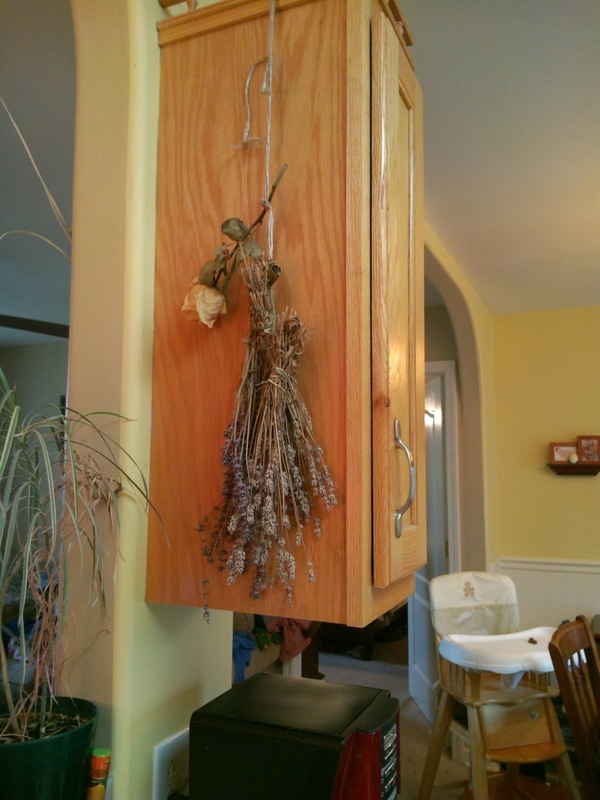 Do you havespices in a cabinet and in the pantry? Could you fit them all in the cabinet and make the pantry only for food. 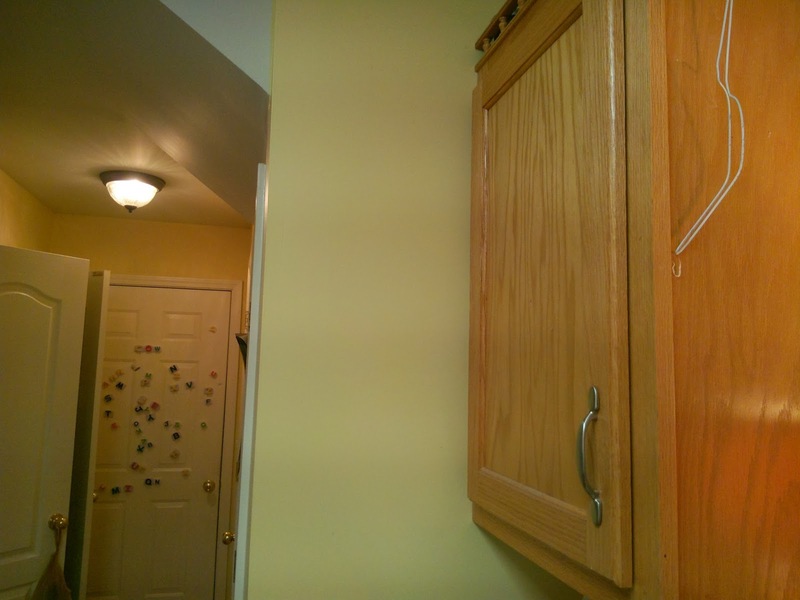 Then the rest of your cabinets can be for dishes and appliances. If you really want to hang the cast iron you might think about putting something to protect the wall/cabinet for when it bangs against it. The section of wall where the clock is might be a good space for some shelves for your devices. Like a bottom shelf even with the bottom of the cabinet for the laptop and another shelf above for phones/tablets. You could put a little basket up there to hold them. You ciuld run a small power strip and place it on the shelf to charge everything. Though I am not sure how messy that might look. I posted my dishes cabinet and those same racks that separate the dishes could be used to get you a little more space i your pantry, you'd just have to put down cardboard or veneer so it didnt slip through the holes. 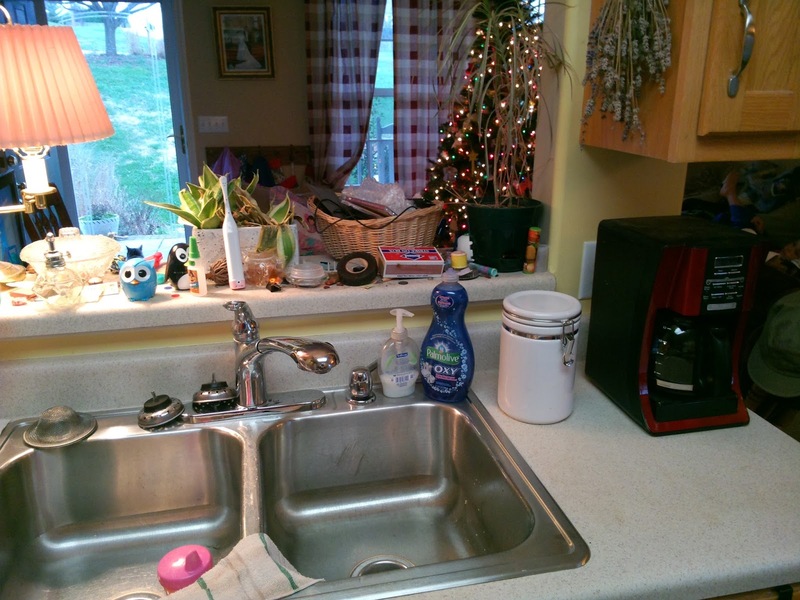 If you wanted to clear off counter space you could turn that table in the corner into a coffee station. One more thing, if you do buy canisters for flour etc. 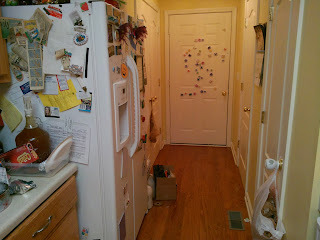 Make sure they are square so that they sit nicely next to each other in the pantry without wasting space. And make sure they can hold the biggest bag you prefer to buy. Hope some of this helps! These are all great ideas. I had wondered about the square canisters. The ones I got for Christmas are round, but I think if I order another set, they will be square. We do have spices in both the cabinet and the pantry. 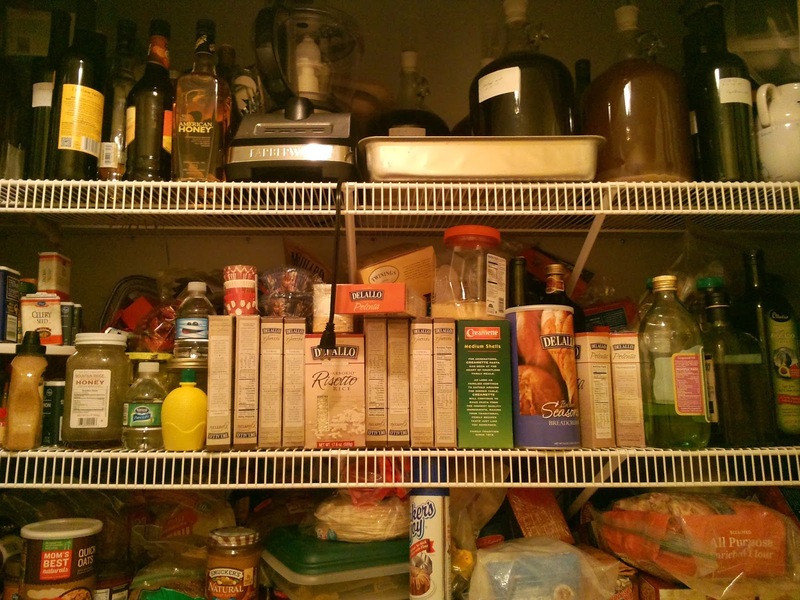 The ones in the pantry are more commonly used and the ones in the pantry are less used. Honestly 75% of it probably needs thrown out. 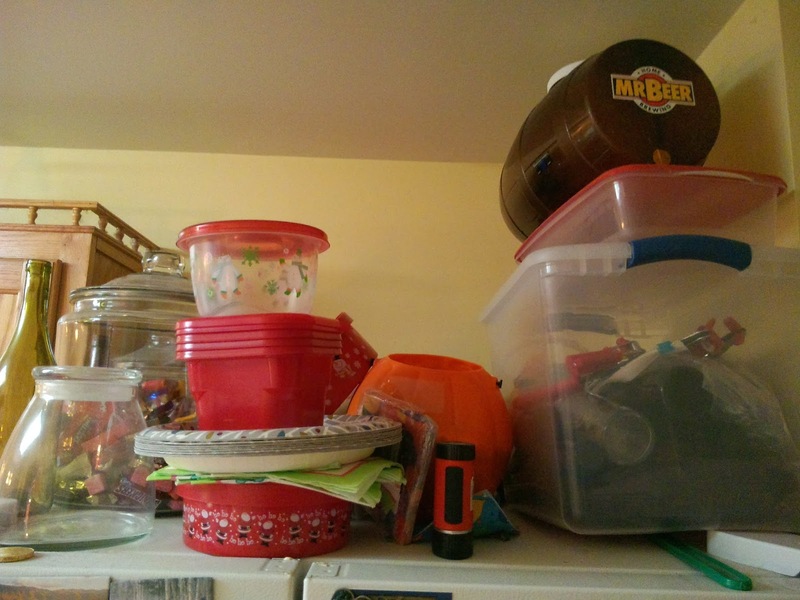 I wonder if those wire racks might be useful in the cabinets to help organize our boxes of tea instead of it all being in a sad, piled jumble. Yes to the racks for organizing tea. I have one solitary cabinet, like yours for the mugs, that houses mugs on one shelf, tea on another and coffee on the other. 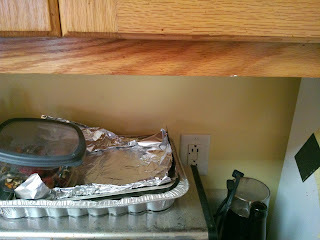 In our old house we housed tea in a drawer (which was awesome for its limiting capacity. Ooops can't buy more tea until we drink what we've got! 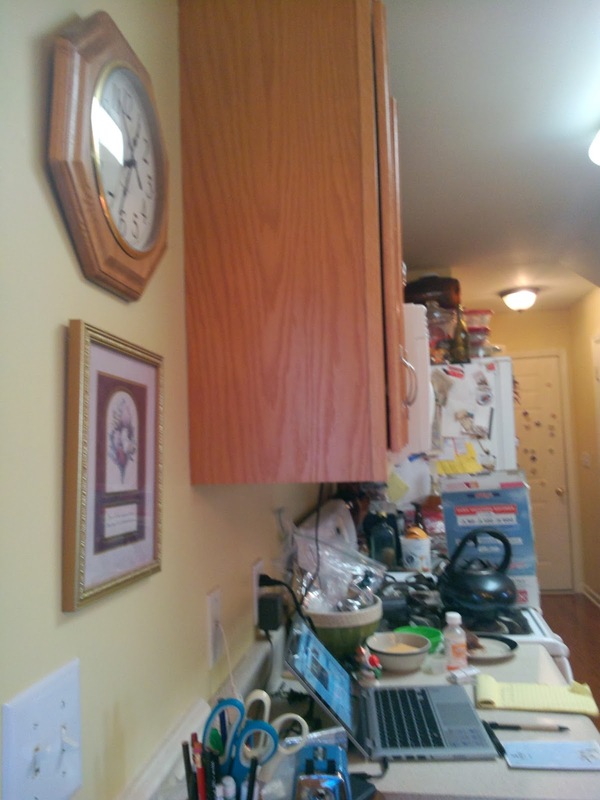 I would turn that spice cabinet into a spice cabinet and put the ones rarely used up top. Then it's all together and extras don't get forgotten in another place. 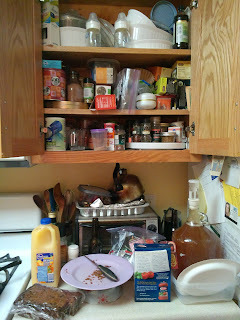 My spice cabinet is kinda messy right now but I could post a pic of that too. I love the change of taking everything out of a cabinet, cleaning it and placing everything in its place (where I fail is in the everyday upkeep, blah...boring) I so wish I could help you with your kitchen! Good luck!